The Edinburgh Quartet was founded in 1959 and quickly became established as one of Britain's foremost chamber ensembles, appearing regularly at prestigious venues across the country including London's Wigmore Hall and The South Bank Centre. It achieved international recognition after winning the Contemporary Prize at the Evian-les-Bains String Quartet Competition and has since toured extensively across Europe, the Far East, North and South America and the Middle East. 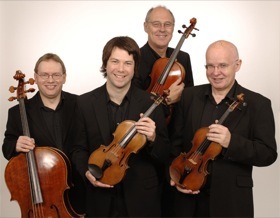 The Quartet have made numerous BBC TV and BBC Radio 3 broadcasts and can also be heard on Classic FM. 2009 marks the Quartet's fiftieth anniversary and it is now one of the longest running chamber ensembles in the UK with a busier performing schedule than ever before. The Quartet is resident at Glasgow University and Napier University and also collaborates with Aberdeen and Edinburgh Universities. In addition to a regular classical concert series at each of these institutions, the Quartet is committed to nurturing talent and championing new music. The ensemble has worked with many important and prolific composers of our age, including the Quartet's patron, James MacMillan and Michael Tippett, who selected the Edinburgh Quartet's recording of his First Quartet for re-release on EMI shortly before his death. This recording is representative of the Edinburgh Quartet's extensive discography available on various labels such as Delphian, Linn, Meridian and RCA. Recent recordings include the complete Hans Gal String Quartets ('Editor's Choice' Gramophone Magazine, 2007), the complete Kenneth Leighton String Quartets ('The unanimity of their ensemble, even at the densest polyphonic moments in flying scherzo tempo, is very impressive.' BBC Music Magazine), as well as discs of Bartok, Robert Crawford, Haydn, Schubert and Thomas Wilson. Future releases include the complete Matyas Seiber Quartets on Delphian Records, which were featured on a live broadcast by the Edinburgh Quartet on BBC Radio 3.